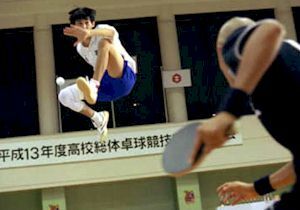 (left) Yosuke Kubozuka takes flight, and (right) Sam Lee represents China. The Skinny: Manga-based sports flick is a little disjointed, but the sure direction and quirky tone make this a winner. And when it's ping pong time, the film really soars. Peco (Yosuke Kubozuka) and Smile (Arata) are two life-long friends who belong to their high-school ping pong team. Peco is the over-confident, borderline egotistical member of the pair, who desires openly to be the world's greatest ping-pong player. However, despite his obvious talents, he's lazy and doesn't apply himself to the sport. Smile (who's so named because he never does), is the opposite of Peco, and plays without passion or love. He says he does so simply to pass the time, and frequently submits to pal Peco during their friendly matches. Things change between the pals when they find themselves challenged at the tables. Their coach (Naota Takenaka) pushes Smile hard, as he recognizes what Smile and even Peco do not: that Smile has surpassed his friend at ping pong. Meanwhile, Peco finds himself emotionally conflicted at Smile's growing skilland his newfound desire to excel. Also factoring in is the arrival of China (Sam Lee), a ringer from (duh) China who's been enlisted by a rival high school to take them to the championship. However, standing in everyone's way is Dragon (Shido Nakamura), the reigning champ, who's so dedicated to the sport that he practices until he bleeds and preps before matches by isolating himself in the toilet. Eventually, Smile and Peco must come to terms with their reasons for playing ping pong, and with what it means to them personally. And, somebody must win. 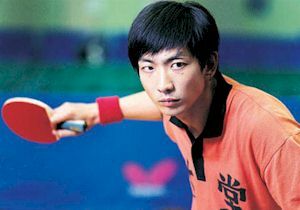 Based on a manga by Taiyo Matsumoto, Ping Pong is a sports story, and as such features the usual sports themes that have been seen in many, many previous films. Tried-and-true issues of friendship, competition, individual desire, love of the game, and sportsmanship fill this flick from end-to-end. Characters openly wonder about their abilities, despair at their lack of talent, and question one another's dedication. Some of the soul-searching seems forced; some characters discover new personal epiphanies at seemingly the drop of a hat. Also, there are your usual big matches and existential sports narration, which really provide nothing new. And, it's all applied to the sport of ping pong, which may not excite every fan of sports films. Still, Ping Pong manages to rise above the pitfalls of the sports genre thanks to sure, judicious direction (courtesy of first-time director Fumihiko Sori), and a predominant tone that could only be described as quirky lyricism. The characters are so over-the-top that they're obviously drawn from manga, but they manage to be winning and always interesting. Yosuke Kubozka brings some genuine emotion to Peco's petulant behavior and fits of mugging, and older actors Naota Takenaka and Mari Natsuki lend fine support to the proceedings. Also, the references to Japanese superhero media, and the deadpan humor (which is typical of Japanese cinema) add charm and whimsy to the proceedings. This isn't gut-busting stuff, but it's funny nonetheless. Then there's the ping pong. While the first hour slyly eschews the ping pong for character and plot development, the second hour comes alive with entertainingly staged matches that play like a cross between Forrest Gump and Shaolin Soccer. Ping pong balls spin and change course in flight, characters leap to return serves, and slow motion abounds. The euphoric sight of the final ping pong duels should erase whatever nagging doubts you have about the film's maddeningly slow pace, or deadpan existential wackiness. Whatever your take on the sometimes bizarre philosophy embedded in Ping Pong, you should find the table tennis action tops.